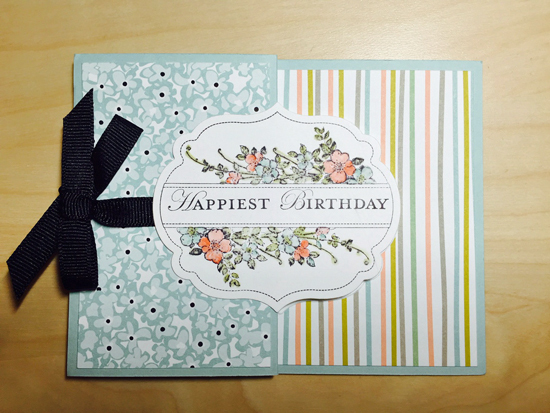 This card uses the retired Stampin’ Up favorites, Apothecary Art and the Labels Framelits. The card is a fold out, make from an 11 X 4.5″ piece of paper scored at 5.5″, and then the left 5.5″ inch section is scored again at 2.25″ and folded outward, accordion-style. The base card is Pool Party, with Sweet Sorbet designer paper. I cut two of the medium labels out of Whisper White. I adhered the one on one the fold first, and then placed the one on the inside so that it was directly under the one on on the front of the fold. I used a blender pen to color the image, using Pool Party, Crisp Cantaloupe, and Old Olive inks. The black grosgrain ribbon is from my stash. I love this card! 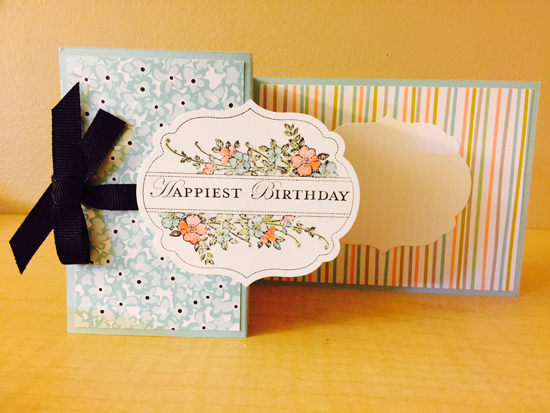 I hope you’ll try this type of folded card—it’s fun to make!